How to round a number up in Excel. The Excel ROUNDUP function allows a user to round a number up in Excel, to a certain number of decimal points. For anyone who performs financial analysis in ExcelExcel ResourcesLearn Excel online with 100's of free Excel tutorials, resources, guides, cheat sheets, and more! CFI's Excel resources are the best way to learn Excel on your own terms. These guides and articles teach spreadsheet formulas, shortcuts, and functions step-by-step with screenshots, templates, lessons, guides, and more it can frequently be important to round a number to a specific decimal place or to a whole number. 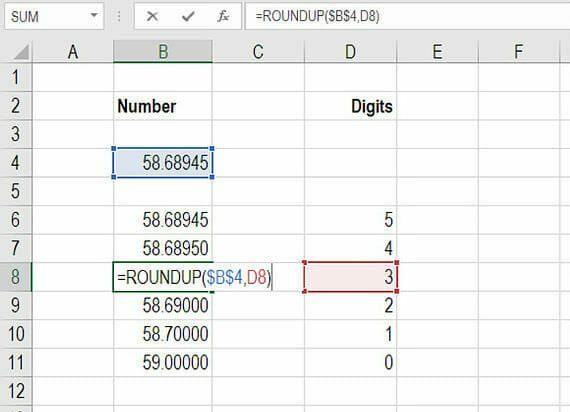 In this session, we will show you how to round a number up in Excel using the =ROUNDUP() function. This formula will be a major help in saving you time when performing financial modelingWhat is Financial ModelingFinancial modeling is performed in Excel to forecast a company's financial performance. Overview of what is financial modeling, how & why to build a model. A 3 statement model links income statement, balance sheet, and cash flow statement. More advanced types of financial models are built for valuation, plannnig, and and will also improve your accuracy in Excel. The Excel roundup formula asks you to reference a specific number and then indicate how many units (decimal places) you want to round it to. In this example we show you how to create a table that uses the roundup formula to link to a number and then return a certain number of decimal places. See the screenshot below for an example of the “roundup” function in action. As you can see in the table above, the number 58.68945 can be rounded to anywhere from 0 to 5 decimal pages. In order to use the function, simply refer to cell B4 and any of cells D6 to D11 to specify the number of decimal places to include. Thank you for reading CFI’s guide to the Excel ROUNDUP function. If you want to become an Excel power user please check out our Excel ResourcesExcel ResourcesLearn Excel online with 100's of free Excel tutorials, resources, guides, cheat sheets, and more! CFI's Excel resources are the best way to learn Excel on your own terms. These guides and articles teach spreadsheet formulas, shortcuts, and functions step-by-step with screenshots, templates, lessons, guides, and more to learn all the most important functions, formulas, shortcuts, tips, and tricks. Excel Round DownExcel Round DownExcel round down is a function to round numbers. This step by step guide on how to round down a number in Excel is useful for financial analysts. With the Excel round down function, this task is quite easy, even for a large dataset. Insert today’s dateToday's DateExcel today's date formula inserts today's date in a cell. It can be very useful to have Excel display today's date when performing financial analysis. This little-known function allows you to insert today’s date easily into any cell in the spreadsheet.